The number of hog lagoons at risk was updated from 80 to 110 at 4:16 p.m. Flood damage from Hurricane Florence is jeopardizing roughly 110 of the state’s 3,300 hog lagoons, but there is another route for waste to leave these farms: runoff from the sprayfields. Farmers routinely pump waste from the lagoons onto the fields, which they use to grow hay and other crops to feed livestock. But spraying waste on saturated agricultural land violates both EPA regulations and the terms of the state general permits under which North Carolina’s hog farms operate. When waste-laden water runs off these fields, it can contaminate nearby rivers, streams, wetlands or adjacent properties. 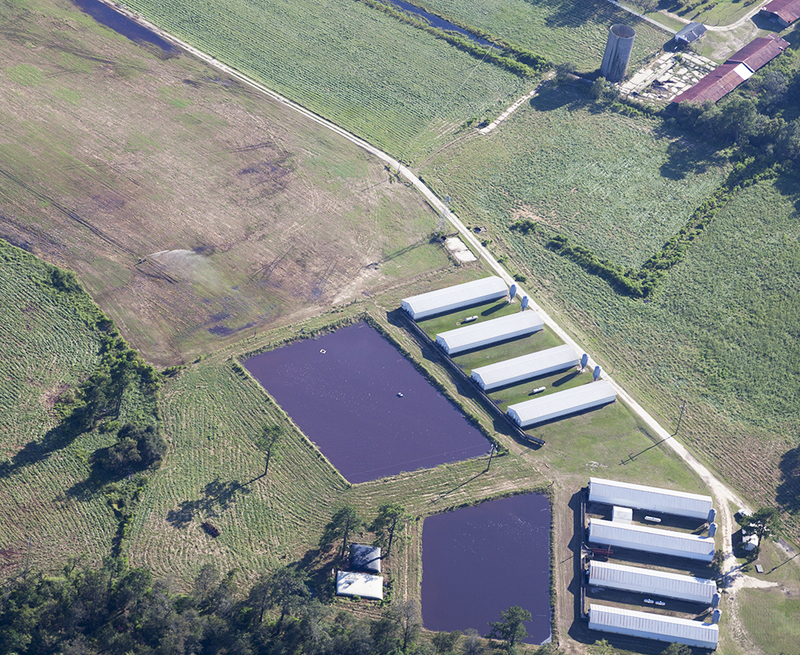 During a flyover of eastern North Carolina on Monday, Policy Watch observed at least two farms that were spraying waste from their hog lagoons, ostensibly to keep them from overflowing — an even more severe environmental disaster in its own right. 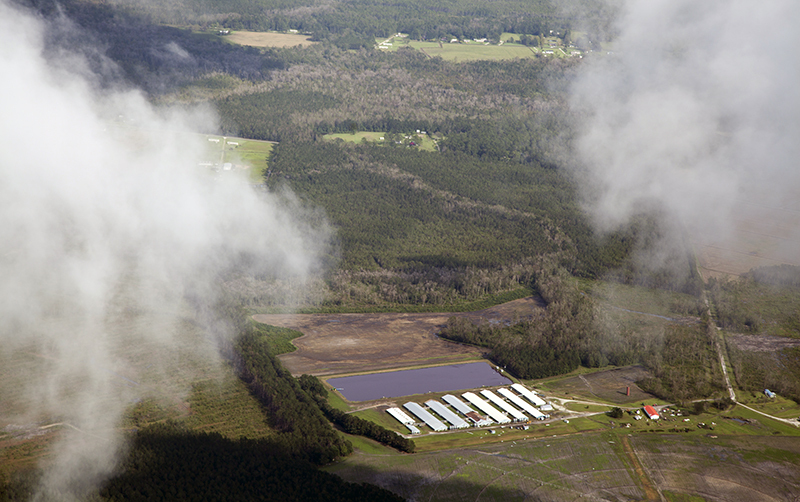 From the air, it was unclear whether the farms were contracted with Smithfield or Prestage Farms. Riverkeepers reported at least a dozen more incidents of spraying, but Policy Watch has not been able to independently verify those accounts. A Department of Environmental Quality spokeswoman said state inspectors couldn’t yet get to the farms to follow up on their operations. The Fayetteville Regional Office, located downtown near Cross Creek, was evacuated. Regional offices in Washington and Wilmington are not fully functioning because of power outages and flooding. It is also illegal to spray within 48 hours of the issuance of a hurricane watch or severe thunderstorm warning. 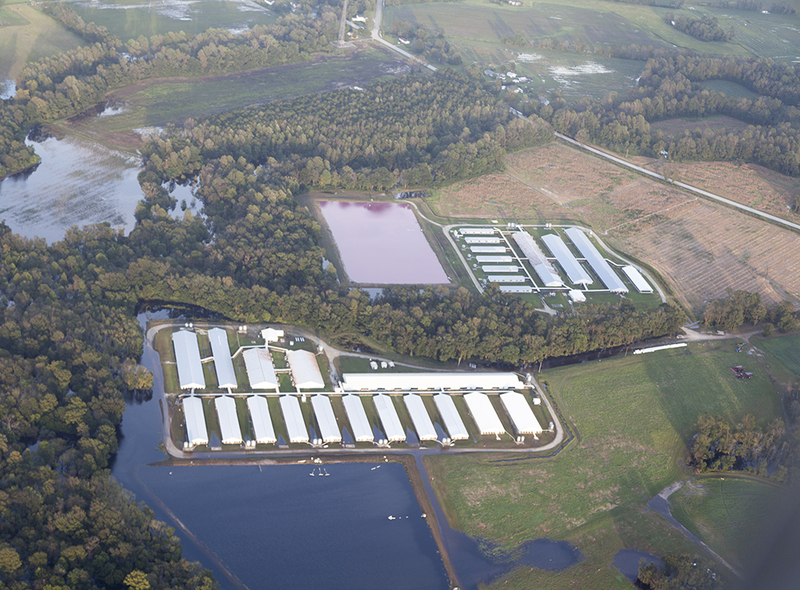 Hog farms and their lagoons in eastern North Carolina, Sept. 17, 2018. The bottom lagoon appears inundated, but it’s unclear whether a breach has occurred. After Hurricane Floyd, Nowlin, then an attorney with the Southern Environmental Law Center, successfully sued the state environmental agency over how it allowed farms to spray their waste. As part of a settlement agreement, the state agreed it would prohibit spraying in the aftermath of a storm, Nowlin said. “If the state turns a blind eye, it’s in violation of that agreement,” she added. The Coastal Plain is less than optimal for industrialized animal operations. Hurricanes and inland flooding imperil the animals themselves, as well as the lagoon-and-sprayfield method of waste management. The storm killed 5,500 of the roughly 9.3 million hogs housed in industrialized farms in North Carolina, and that number will likely increase as flood waters recede and reveal the carcasses. Smithfield tried to stem the number of fatalities by transferring hogs from farms that were flooded in 1999 during Hurricane Floyd to operations outside that vulnerable area. Floyd was a catastrophic turning point for the hog industry; it killed an estimated 30,000 hogs and unleashed a 500-year flood, meaning the chances of such an event occurring in a given year is 1 in 500, or 0.2 percent. However, Hurricane Florence outdid Floyd, with eastern rivers rising at least 5 feet from record levels. “It was new territory for the industry,” said Kraig Westerbeek, senior director of Smithfield Renewables and Hog Production Division Environmental Affairs. Prestage Farms couldn’t be reached for comment. The poultry industry sustained even greater losses: at least 3.4 million birds. The NC Department of Agriculture has issued protocols for the disposal of animal carcasses, including buffer zones between the composting area and waterways and property lines. In some cases, the bodies can be deposited in landfills. “One of the disconnects here is dealing with the mortalities,” Nowlin said. The disposal falls under not DEQ but the NC Department of Agriculture’s veterinary division, which focuses on preventing disease. “Where the animals are disposed and how,” is important, Nowlin added. If they are improperly disposed of, the decaying bodies can contaminate groundwater. It takes about 28 days for a chicken carcass to decompose, and six months or more for larger animals. This hog waste lagoon appears to have been spared. All North Carolinians have a vested interest….both in clean air & water and in an affordable food supply. Agribusinesses and neighbors in close proximity are at odds over definable boundaries which is a problem best solved in cooperation not litigation. Most.. if not all.. family operated farms are sincerely active in the stewardship of these resources. Keep in mind that these facilities were constructed years ago PER THE SPECIFICATIONS OF STATE OF NC ENGINEERS & ENVIRONMENTAL OFFICIALS and operate per those requirements. Its time for new science and better practices to preserve both natural resources and our food economy. The blame game only serves to entrench old positions .